A year and a half after a suit was launched and five years after an agreement on the Paks II NPP expansion was signed between Hungary and Russia the Municipal Court of Budapest ordered the government to disclose the bulk of the contract. Following two deferrals a second instance verdict was reached in early February, 2019. 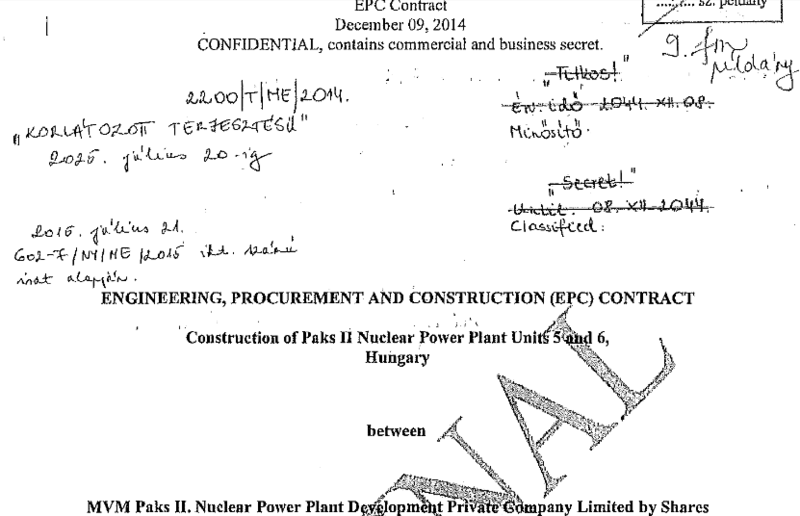 On 28 March the publicly-owned Paks Ltd. released a redacted version of the 110-page EPC contract between Paks Ltd. and a subsidiary of the Russian state nuclear corporation Rosatom. Two of the government-friendly news outlets, Magyar Nemzet and Origo, neither of whom were parties to the suit, published commentaries about the Paks contract before the complainants themselves were even aware of its publication. Both sources reported that the “secret contract affair” had been “settled at last” and concluded that the contract appeared “particularly favourable to Hungary; with robust legal protections”. But the measures – at times extreme – that Prime Minister Orbán has taken to keep a tight lid on the project specifics are curious for an investment with such favourable economic prospects. Also curious is the magnitude of funds that have been allocated to promote the project. Access was denied to Bernadett Szél, leader of an opposition party and member of the National Security Council; many of the technical and financial conditions of the project were also unknown until the Freedom of Information Authority was asked to intervene. In 2017 Hungarian Dialogue MEP Benedek Jávor and Szél turned to the national Freedom of Information Authority (NAIH) to determine whether the “state secret” classification of the contract was justified. The bulk of the documents were declassified before the investigation ended, but the NAIH still supported the concealment of information that could have geopolitical consequences and a significant impact on both the country’s economic future and its safety. On 13 January, 2014, the Hungarian government spokesman announced that the Prime Minister was in Moscow to discuss economic affairs with the Russian President. The following day Rosatom and Paks Ltd. signed the nuclear expansion agreement; it was declared that the Russian state bank would also provide a €10 Bln loan to finance 80% of the project under conditions that were not shared at the time. Government officials maintained, and continue to maintain, that the decision had already been authorized by the National Assembly in 2009. In reality, the resolution only consented to the initiation of preparatory activities for a nuclear expansion. Many key impact studies and feasibility reports were kept under wraps prior to and following the signing of the agreement, and MPs and NGOs are still seeking access to expert opinions that, in principle, should already be accessible to the public. In principle, the government has the duty to make the contracts of all publicly-owned and publicly-funded entities public. In practice, the electorate has been entirely excluded from a decision with profound political and economic implications. Benedek Jávor MEP has been fighting for access to the implementing agreements that stipulate the design, construction, operation and maintenance of the two VVER reactors since 2014 and launched a suit against the government and Rosatom in 2017. Under a first instance decision in May, 2018 it was established that Hungary’s Freedom of Information Act applies to international agreements as well as to national ones, and that the government could not justify classifying thousands of pages of a public contract. The Court also recognized that the MEP’s access requests had “not been abusive,” as the defence attorney had argued. Notably, the second instance court contested the legitimacy of the “national security” grounds exception that the first instance court had recognized, but identified a number of sections that would remain classified to protect the business interests of Rosatom. This includes the project’s execution schedule, official permit details and technical documentation along with sections covering liquidated damages, general limitation of liability, and most importantly, termination conditions. In a separate case, Hungary’s leading economic and political news weekly HVG also won its lawsuit to access the contract on 7 March, 2019. HVG argued that the judgment appears to suggest that the governments of Hungary and Russia determined that nuclear safety aspects must also remain secret to protect business interests. It is not clear from the judgment on what grounds Rosatom’s business interests override the public’s interest in disclosure of the termination conditions—potentially a sum of around €12 Bln which could effect the central budget for decades to come. Neither HVG nor Jávor are entirely satisfied with the amount of information that Paks II Ltd. released publicly. Their prime objective with the lawsuits was to discover the potential financial repercussions of unilateral contract termination, which are as yet unclear. Jávor argues that the disclosed documents represent only a fraction of the total contract portfolio, which may include thousands of pages of annexes. In the meantime, the daily Népszava reports that Russian designs are continually failing to meet EU standards and that a shortage of skilled workers in Hungary is a pressing problem. In January of 2019, the head of the opposition party LMP submitted a freedom of information request to learn the amount of the additional costs of the Paks nuclear plant expansion resulting from the project’s now significant delay. The right-wing opposition party Jobbik also announced that it wants to establish a parliamentary committee to review the Paks II project. Given the government’s track record, neither initiative has much likelihood of success. For his part, Benedek Jávor MEP announced that he intends to submit further freedom of information requests related to the contracts. At a press conference on 3 April the MEP urged the Hungarian government to initiate the annulment of the Paks expansion contract, arguing that neither Hungary nor Russia have the skilled capacity to meet the deadlines with quality work. Citing security risks, he added that repeated attempts to undercut official permit procedures will compromise the integrity of the process, leading to nuclear safety risks. The Hungarian government adopted an act, akin to a state of exception, which permits it to bypass legislative protocol to accelerate the adoption of policies and projects considered “important for the national economy”. Earlier this served as the basis for Atomic Energy Act amendments, which, in breach of the Euratom Treaty and the Convention on Nuclear Safety, would have enabled the government to issue nuclear permit procedure “decrees” in lieu of independent nuclear regulators. These provisions were repealed due to pressure from the European Commission which had been made aware of the inconsistency by NGOs. Needless to say (one would hope) the “effective separation between the functions of the regulatory body and those of any other body or organization concerned with the promotion or utilization of nuclear energy” is mandated in the Convention on Nuclear Safety because conflict of interest could adversely impact nuclear safety. The Energiaklub climate policy institute noted at the time that neither the government nor the Commission issued public communications on the matter. Presumably under great pressure to limit the financial consequences of the delay, Hungary’s Prime Minister is again resorting to extreme measures: a legislative package was adopted on (Sunday) 7 April that, inter alia, simplifies and accelerates the permit process and, according to Jávor, shortens certain permit deadlines by a third. The bill advocates the revision of administrative deadlines of the nuclear regulator’s procedural regulations to “ensure that the investment in the Paks Nuclear Power Plant is suitably effectuated”. Both pro- and anti-nuclear advocates see eye to eye on the fact that safety can only be assured by a range of independent and well-informed oversight bodies. As is the case with any controversial initiative, the public also plays a role in monitoring its effects or in holding governments or industry accountable. The United Nations called access to information the “touchstone of all the freedoms” at its opening session in 1946, because, without timely and accurate information citizens are not in a position to assess the legitimacy of decisions made on their behalf. Access is a necessary basis for exercising a broad range of civil and human rights. This is the first of three articles examining the transparency and safety implications of Hungary’s nuclear power plant expansion. Christiana Maria Mauro is a Project Leader at Eticas Research and Consulting. She has contributed to public interest advocacy projects at the European level, focusing on issues of civil liberties. Her background in social sciences, humanities and law supports Eticas’ creative approach to social and practical problem-solving by highlighting the broader context. She’s a member of Nuclear Transparency Watch since 2018. Just before his resignation, energy minister Richard Harrington announced a further £7 million of funding to regulators to build the capability and capacity needed to assess and licence small reactor designs, and up to £44 million pounds in R&D funding to support Generation IV advanced reactors. This came on top of earlier promised £460 million in the UK government’s Clean Growth Strategy to support work in areas including future nuclear fuels, new nuclear manufacturing techniques, recycling and reprocessing, and advanced reactor design, £8 million on modern safety and security methodologies and advanced fuel studies, and £5 million on materials and manufacturing as part of a Small Business Research Initiative. In Europe, we are currently in an active debate about how the public should be involved in decisions around the extension of the lifetime of ageing nuclear power reactors beyond the their initial technical lifetime of 30 or 40 years: There are court cases on the issue in Belgium and the Netherlands; the European Court of Justice assesses questions from the Belgian High Court; the Aarhus Convention Compliance Committee recently found the Netherlands in non-compliance with the Aarhus Convention for not organising public participation; Ukraine has been found in non-compliance with the Espoo Convention; and the Espoo Convention parties are deliberating in a special ad-hoc working group. Because of the wider European debate, it is interesting to see what the nation with the most nuclear reactors in Europe is doing in this respect. Most of France’s nuclear fleet of 58 reactors was built in a relative short time period in the 1970s and 1980s and the entire fleet is now facing the end of its initial technical lifetime of 40 years. Under the obligations of the Aarhus Convention, any decision to prolong their lifetime should be preceded by meaningful public participation concerning environmental issues – this was recently confirmed during the case of the Dutch nuclear power station Borssele. The primary advisor to the European Court of Justice, advocate general Juliane Kokott came in the end of last year to the conclusion that the Espoo Convention and the EU EIA Directive in conjunction with the Aarhus Convention oblige Belgium to carry out an Environmental Impact Assessment for the life-time extension of the Doel 1 and 2 nuclear reactors. The European Court is expected to come with its response later this year, and it is widely expected that this verdict will also make an EIA necessary for France’s fleet. In a tradition of transparency, followed since 2005, the French nuclear regulator ASN (Autorité de sûreté nucléaire) has decided to organise a public consultation on the lifetime extension of nuclear reactors beyond 40 years in two stages: first a general consultation per group of reactor designs, followed by a reactor specific consultation with more detail. The first group is that of the 900 MW reactors, and the NPP Tricastin will be the first detailed case to follow. ASN has asked the High Commission for Transparency and Information Concerning Nuclear Safety (Haute Commission pour la Transparance et l’Information sur la Sécurité Nucléaire – HCTISN) to organise the consultation on the 900 MW reactors, in order to guarantee independence. This consultation consists of an on-line part (only in French) where people can react on statements (and information) from EdF as well as add their own points of view. Regional hearings will also be held in the entire country with a focus on areas around these reactors (also only in French). The consultation is overseen by two from HCTISN independent guarantors, Marianne Azario and Isabelle Barthe, who can be reached by email garantes.concertation@sûreténucléaire.fr for any questions relating to the process of consultation. The local CLI’s – local information committees – play a crucial role in implementation. It is clear that there are some fundamental weaknesses in this consultation set-up. It concentrates only on technical safety criteria and does not include a full environmental impact assessment as required under Espoo and the EIA Directive. France is one of the countries that vehemently tries to undermine this obligation within the Espoo Convention. It also does not provide all available environmental information for public scrutiny, as required under the Aarhus Convention, and therefore makes the whole process vulnerable for legal challenge. Nuclear Transparency Watch is of the opinion, that on the basis of the Espoo and Aarhus Conventions and the EU SEA and EIA Directives, which are all implemented in French law, a Strategic Environmental Assessment should be an integral part of the general consultation, and a detail EIA of the following project procedure. This is, because the information and viewpoints gathered in these procedures will deliver crucial information to be used for the risk perception of the nuclear regulator. It will provide environmental, social and economic justification for or against longer lifetimes not only for the nuclear regulator, but also other political decision-makers involved, including decision-makers within the utility EdF. At this moment, SEA and EIA procedures can still be included in the process. If this does not happen, the entire legitimacy of the public participation exercise will likely be challenged on the basis of lack of meeting international obligations. Another important issue is the inclusion of viewpoints from outside of France. Many of France’s nuclear power plants are near borders, but even those in-land can have impacts far beyond France in case of a severe accident with emissions of radioactive content. Nuclear Transparency Watch member Brigitte Artmann asked the HCTISN whether the consultation is open to citizens of other countries. In its response, the HCTISN made clear that this is indeed the case and its consultation website also has an extensive explanation of the process in English, as well as a link to a 20 page English executive summary of the basic information delivered (the so-called Fulfilment Report). For the rest, more detail information is only available in French and participation is only possible in the French language. Nuclear Transparency Watch is of the opinion that that is not sufficient. With its 1970s choice for large scale development of nuclear power, France also took on itself the responsibility for all potential impacts, also those outside of France. Availability of material only in French is insufficient, but especially a possibility to submit viewpoints in other large European languages (at least English, German and Spanish) should be possible. By not giving that opportunity, the public consultation process does not fulfil the minimum criteria of non-discrimination in the Aarhus Convention and the obligation under the Espoo Convention to give equivalent access to public participation procedures for citizens in potentially impacted countries. Nuclear Transparency Watch calls upon its members and others in civil society to participate in this consultation, while making clear that there should be broader possibilities under the obligations under Aarhus, Espoo, European and indeed French law. The petition committee of the European Parliament (PETI) received over the last years several large petitions expressing concern about transboundary nuclear issues in countries like Belgium, the Czech Republic, the UK, Hungary and others. In reaction to that, it asked the Policy Department for Citizens’ Rights and Constitutional Affairs of the European Commission’s Directorate General for Internal Policies of the Union to commission a study to address the issues raised in these petitions. The lead authors of that study, prof. Michael Faure from the Netherlands Maastricht University department of environmental law and the Rotterdam based Erasmus School of Law and Dr. Kévine Kindji of the Maastricht European Institute of Transnational Legal Research (METRO) at Maastricht University, produced a comprehensive overview of legal developments around transboundary nuclear issues, including a large chapter on the developments of environmental liability. The study addresses the EU situation within the framework of international bodies and agreements like the IAEA and the Convention on Nuclear Safety, issues of public enforcement of international legal obligations on transboundary nuclear issues, addresses the tension between the EU Treaties and Euratom, covers citizen en NGO involvement in decision making, and comes with ten recommendations in which the European Union could improve the haphazard current situation with better regulatory oversight, harmonisation of rules, and improvement of the nuclear liability regime and implementation thereof. The study gives a very good overview of the state of play of what is a very dynamic legal situation. NTW member Dr David Lowry is widely known for his stubborn and very effective work on nuclear transparency in the UK. Over the years, he has used all the tools in the legal toolbox to prevent important information being kept out of the public domain and in that way influenced many important nuclear debates in Britain. His instruments include access to information requests, but also parliamentarian questions and intensive on-line research. Dr David Lowry calls on NTW members and others following nuclear developments to more intensively use these instruments. That is an important call, because his work shows that the lack of transparency in the nuclear sector still enables politicians to hide the complexity of nuclear decision making, including issues around the true cost of nuclear energy, the important role of co-operation in nuclear medicine, the ongoing radioactive waste problem, and even the link between civilian and military nuclear sectors. Lowry’s work gives extremely good examples how to go about delivering more transparency in real life and we certainly will feature more of them here in the future. NTW also plans to set up a library where this kind of information will be stored so that other nuclear transparency activists can maintain access. Last month, Lowry revealed key-information on the nuclear fall-out of the Brexit process on the loss of co-operation in the field of nuclear power, that he had obtained over parliamentarian questions. In a detailed blog including the full response from the Chair of the Business, Energy and Industrial Strategy Committee in the British Parliament, Rachel Reeves, to the Energy Minister Richard Harrington, he sharply analysis how the industry bias of this MP leaves out important issues from the national debate and counters that with what a different Committee in the House of Lords has found on the subject and explanations and reactions from different other UK politicians, and adds background material. A second blog addresses the thorny issue how title swaps of plutonium from reprocessing will be influenced by Brexit. Again, Lowry extensively quotes from official answers Green MP Caroline Lucas received on Parliamentarian questions from the relevant responsible politicians. Lowry then continues to analyse how this is fundamentally wrong and illustrates that with how Swedish plutonium from its closed R-1 reactor in Oskarshamn, now in the UK after reprocessing in Sellafield, is to be transferred into UK ownership, one of several of such transfers. This opens for me from this side of the Channel the concern that without Euratom overview, it becomes unclear what the long-term fate of this plutonium stockpile will be. Will it end up in MOX, will it have to be disposed of in a for now non-existing disposal in the UK, or may it be diverted to the UK’s military programme? The background documentation that Lowry gives only increases the picture of a lot of high-brow talk but little assurances. On 28 November, Nuclear Transparency Watch (NTW) and the European Environmental Bureau (EEB) informed the European Council and the European Commission of their decision to suspend cooperation with and participation in the European Nuclear Energy Forum (ENEF). ENEF is presently a conference held every year in Bratislava or Prague, and was set up in 2007 by the European Council as a platform for discussion by all stakeholders about the future of nuclear energy in Europe. The ENEF conferences organised by the Czech Republic and Slovakia together with the European Commission. NTW and the EEB have participated in the Steering Committee of the forum, together with representatives from the EESC, Foratom, Eurelectric, the Commission and the two organising member states. In the letter (1) the two organisations explain that ENEF is still not fulfilling its Council mandate and that civil society actors like representatives from NGOs, independent academics and others have basically been used as greenwash for a nuclear propaganda event from the Czech and Slovak governments. NTW and the EEB also call on other civil society actors to further boycott ENEF. In 2015, the European Commission had invited NTW and the EEB to participate in the Steering Committee in an attempt to reform ENEF, in order to make it fulfil the Council’s mandate. It became soon clear that the format of panels followed by a few questions from the room was not the basis for a constructive discussion about all the factors that influence the role of nuclear energy in the European Union energy policies. Attempts to introduce more participative formats were met with scepticism by the Czech and Slovak organisers and part of the industry participants. NTW and the EEB lauded the attempts to attract more participants from civil society by covering travel and accommodation for those who could not afford it themselves, but this did not create sufficient balance against attempts from the Czech and Slovak organisers to create a nuclear promotion event, mainly for the own market. Press conferences lacked translation and focused only on local political issues, not on the role of nuclear energy and its myriad of problematic issues that were to be discussed in the forum. After three years of constructively trying to support the European Commission in its effort to create a real participative and transparent event with open discourse among participants, NTW and the EEB concluded that their efforts were a waste of energy and called on the Council and Commission to find other more inclusive and participative ways to assess the role nuclear power in the future of the Union. The Commission’s failed attempt to improve ENEF came after Greenpeace, Friends of the Earth Europe and Sortir du nucléaire together with the French umbrella of nuclear information committees ANCCLI in 2007 attempted to support the creation a forum on the basis of inclusion of all stakeholders according to the mandate given by the Council. In 2009 the three NGOs decided to leave the Forum because also then they felt abused by the industry and the organising member states for nuclear propaganda purposes, whereas their input was marginalised in publications related to the forum. This led to the formation of an alternative organised by the European Commission, ANCCLI, Greenpeace, and others in the form of the round-tables on the implementation of the Aarhus Convention in the Nuclear sector (ACN), and annual counter conferences to ENEF in Prague and Linz organised by the government of Upper Austria and Czech and Austrian NGOs. Nuclear Transparency Watch grew out of the ACN round-tables with support from members of the European Parliament and the EEB. In the meantime, ENEF withered away as a Czech and Slovak industry event. The European Council asked the Commission to reform ENEF in 2015, and the Commission invited NTW and the EEB to help in the effort as members of the Steering Committee overseeing ENEF’s organisation. During that period, both organisations several times drew the attention of the Commission during Steering Committee meetings and in formal letters to issues that systematically block fair discourse in the Forum. The failure to introduce discussion processes that allow all participants to exchange information, viewpoints and opinions in a way that facilitates cross-fertilisation. Early November, five environmental and peace groups asked attention for a host of problems that is currently facing the nuclear energy policy of Finland. Women against Nuclear Power and Women for Peace from Finland, Nuclear-free Gulf of Botnia and the Peoples’ Movement Against Nuclear Power And Weapons from Sweden together with the Public Council of the South Coast of the Gulf of Finland, Sosnovy Bor, Leningrad Oblast of NTW member Oleg Bodrov from Russia started a petition that highlights among others the cost overdraws and increase of construction time of the Olkoluoto 3 and Hanhikivi power plants, and the complications for the country’s high-level radioactive waste site Onkalo from the doubts about the viability of the KBS-3 waste containers under development in Sweden, which face a negative advice from that country’s environmental court. They call for a fundamental shift in orientation of Finland’s energy policy towards renewable energy sources. The organisers call on organisations, networks and movements to join the petition before it will be delivered to the Finnish president, government and parliament in the start of 2019, and need to participate before the 15/12/18. The petition is available here and more information can be obtained at ullaklotzer@yahoo.com. Nuclear Transparency Watch together with the German office of Heinrich Böll Stiftung and the Greens/EFA organised an event in Berlin on 01-02/10, in the premisses of Heinrich Boll Stiftung. Participants will discuss how Europe can find a sustainable solution to nuclear waste. The deep geological disposal of radioactive waste in underground containers is being pursued as an affordable and viable solution. For this method, one needs to identify a site and a safe containment technology, and achieve broad public acceptance – and none of these steps are easy. In the last years there have been dynamic developments on nuclear waste disposal in Germany, France, and Sweden. In Germany, public opposition against disposal in Gorleben has resulted in a special commission tasked with finding a proper site. In France, the government has unilaterally opted for disposal in Bure, but is facing tough public resistance as well numerous technical issues. In Sweden, a broadly accepted site and storage concept was stopped last February in the Environmental Court due to its risky technological containment solution. A special emphasis will be put on the recent policy developments in Sweden, Germany and France, but the workshop will also allow time to discuss nuclear waste concerns in other European countries. Jan Haverkamp (Nuclear Transparency Watch Europe).